1. Why make this website? 3. How do I find a specific sound effect? 4. What qualifies as a sound effect for inclusion in the database? 5. What comics are included in the database? 6. Why include some creator credits but not all? 7. Why does this site look so ugly? 9. Can you please add a specific comic book? This website was created as an educational resource, spotlighting all of the sound effects that are written out in American comic books. Many sound effects are designed to blend in with the rest of a comic, and I think they are an under-appreciated part of the comic book form. This website will show the evolution of the sound effect over time, and spotlight the unsung letterers who create them. This website is not intended as a place for you to read an entire comic book online. Only panels that contain a sound effect will be included. Because I am only using a small portion of comic books, removed from the context of the story, and present them in a nonprofit educational site, the panels should fall under the fair use doctrine of U.S. copyright law (maybe? I hope? please don't sue and spoil the fun). FX: This is the sound effect as written in the comic. The exact spelling is used, along with any punctuation that goes with it. If the FX goes behind some of the art, a best guess will be used to fill out the word as if it were not hidden. Description: A brief sentence describing the action that creates the sound. Whenever possible, the description will use a gerund (-ing verb) to describe it. Comic: This is the comic in which the sound effect appears. You can click it to see all the sound effects from that single comic. The year in parentheses is the year in which the series began, in order to differentiate from other series of the same name. The second line lists the company that published the comic, along with the cover date. In the event a cover date covers more than one month (for example, January-February 1999) only the first month will be displayed. Credits: Here you will find the title of the story in which the sound effect appears, along with the writer and letterer of that story. If there is more than one letterer in a story, it should display the correct letterer who worked on this panel, if that information is known. Tags: Each sound effect is described with a series of tags. The tags describe the action shown, the category of the sound effect, any recurring characters that appear in the image, and the genre of the comic, if applicable. Tags are very useful because entries for sound effects spelled "BOOM", "BOOOOM" and "BOOOMM!" because they will all have the same categorized tag -- "BOOM" -- allowing for easy searches. Clicking on a tag will display all the entries with that tag. Tags can be shown and hidden by clicking on the button. Picture: The picture shows the single panel in which the sound effect appears. Sometimes a sound effect will appear by itself between two panels. In this case, both panels will be shown with the sound effect. You have many options to find effects. Your best bet is to use the advanced search page. There are three main searches, which also appear at the top of every page. TAGS search through the tags that describe and organize the sound effects (see above). SOUND searches the exact spelling of the sound effects. DESCRIPTION searches through the brief description in each entry. On the advanced search, you can also search for the name of any comic, or search for a specific issue. 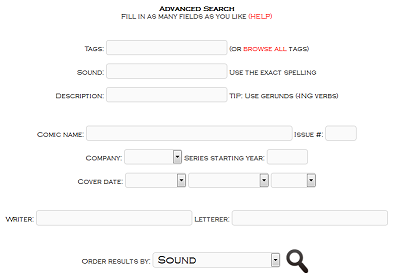 You can filter your searches to single publishers or a single series. The "series" field lists the year in which the series began, in order to differentiate from other series of the same name (instead of Volume 1 or Volume 2). You can also set a range of dates if you're interested in one particlar era. You can limit your results to those sound effects written by a specific writer or drawn by a specific letterer. Finally, you can order your results alphabetically by the sound effect, alphabetically by the comic book name, or in the order in which the effects were published. So if you're looking for the first appearance of "SNIKT" or "THWIP," enter that in the FX field, and set the order field to "Date (older first)". If you would like to include "SNIIKKKT" in addition to "SNIKT", use the tag field instead of the FX field. The FX field will only return results with the exact spelling you entered, and so is much more limiting. Alternatively, click here to browse a list of all tags that describe and organize the sound effects. If you know the exact spelling of a sound effect, click here for a list of all sound effects. If you know the exact comic book in which it appears, click here for a list of all comic books. Any sound effect or onomatopoeia that I can represent here with letters, numbers or punctuation will be included. I won't include sound effects that are made up of symbols like muscial notes or hearts, or alien characters, because I can't sort them in the database. 1) The sound effect must be in display type. In order to add as many comics as possible, I can't read every word. This means the sound effect has to be significantly bigger or in a different type style than the regular dialogue to be seen and included. This rule also puts a greater focus on the art of lettering. 2) No spoken words allowed. I want to add verbal onomatopoeia lke "BWA HA HA" and "AIEEE" because they are a critical part of comic book sound effects, but I'm not going to add someone saying "WOW!" or "NO! ", even if they are in display type, because those are not sound effects, just words. This also applies to dialogue derived from real words, like "WOWEE!" and "NOOOO!" For panels with multiple sound effects, sounds of the same type that are directly related to each other, like multiple guns firing in a shootout, will be combined into one entry. Multiple sound effects that are less directly related -- like a gunshot and a victim yelling "ARRGH!" -- will have separate entries but link to the same image. For a list of comics I've added to the database so far, click here. For a list of comics I've catalogued but which do not contain any sound effects, click here. I plan to be add many more comics and be as inclusive as possible. However, to start I am only going to include comics that were published in the United States. I am also going to exlude underground comics for the time being. Reprint books will also be excluded. I am starting the database with Silver Age Marvel, starting in November 1961, the month that Fantastic Four #1 premiered. I am moving forward month-by-month. For a good resource to see which comics I will likely add next, see the Time Machine at Mike's Amazing World of Comics. Right now my database only has comics from November 1961. After Silver Age Marvel, I will most likely move on to DC and other companies in the Silver Age next. 6. Why include the writer and letterer credits but not the other creators? The writer is included because he or she may have written the script describing the sound effect. The letterer is most likely the person that actually created the effect on the page. After much thought, I have decided to include the penciller because it appears sound effects are being created by them more and more these days, particularly on books that want that hand-drawn look, and it's often hard to tell what is done by the letterer and what's been done by the penciller. While the inkers, colorists, etc., may have played a large part in creating the panel to the right, they likely did not create the sound effect itself, and that is the focus of this website. In a case where someone else did create a particular sound effect, he or she will be listed as letterer if that information in known. If you're looking for more complete credits for a comic book story, I suggest the Grand Comics Database or ComicbookDB.com. I also created this site to better teach myself PHP code. I'm not a professional web developer, so if this looks bad on your phone or tablet, I can only say I'm sorry. It was developed and looks best on a desktop or laptop computer. I either taught myself all of the HTML, CSS and PHP for this site, or stole code from friendly how-to sites. This site was created over the course of a month in the spring of 2013 (so please don't hack in and spoil the fun). Do you want to add sound effects? You can't right now. Until I add a LOT more comics to serve as a base, I'm not going to open the database for editing by others. By keeping it all done by myself, I can ensure the quality is equal across the site. This may change in the future, but I'm not the most experience web developer, so this change may be very far off. I do welcome all feedback and corrections, no matter how small. If you think I missed an effect or included a typo, or messed up anything else, please let me know. Most likely not. To start, I am concentrating on certain eras and companies. Right now, that's Silver Age Marvel. Once I complete those, I will likely move on to Silver Age DC. It would look pretty strange to have nothing but Silver Age, and then an issue of Milk and Cheese, so I can't take all requests. If you are looking for a comic in the era in which I am currently working, I might be able to move it up my list. For the site blog and a list of site updates, click here. If you are interested in seeing what I am reading, please click here. This is for my own reference and is not related to the website or what comics I am adding next. My name is Rick. I welcome all feedback and corrections. Please send me an email at rick [at] comicbookfx [dot] com or hit me up on Twitter: @ComicBookFX. Thanks!